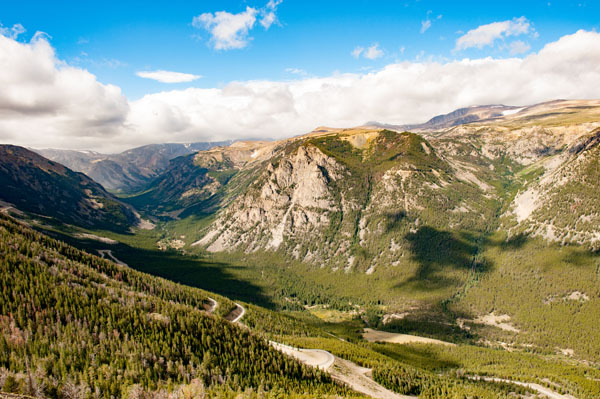 Anchored at either end by the delightful mountain towns of Cooke City and Red Lodge, the Beartooth Highway 212 is arguably the most beautiful drive in America, with its jaw-dropping views of the Absaroka-Beartooth Wilderness. 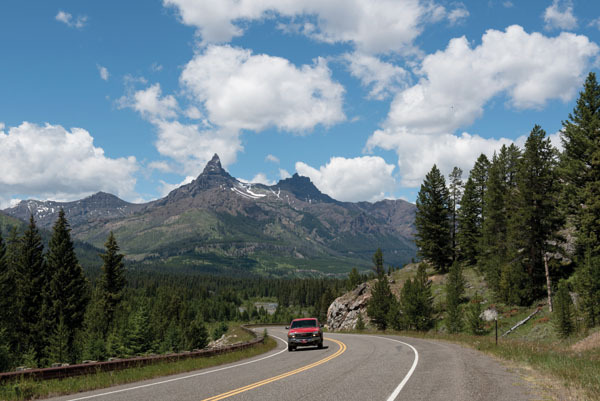 Designated as the “Beartooth All-American Road,” this is a seasonal drive, generally opening on Memorial Day weekend and closing in mid-October (weather dependent). First opened in June 1936, this engineering marvel of a road is flanked by both the Custer Gallatin and Shoshone National Forests as it weaves through Montana and Wyoming, eventually landing at the doorstep to Yellowstone National Park. 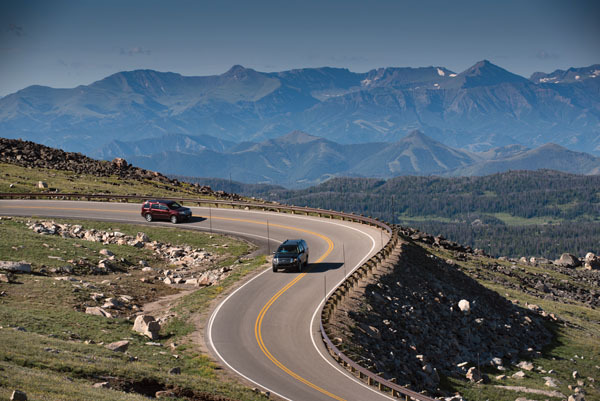 This 68-mile drive can take your breath away, with a landscape that encompasses 20 mountain peaks over 12,000 feet and a highway that peaks at 10, 947 feet — an altitude that may challenge flatlanders. The drive can be as short as three hours, but to hike, picnic and photograph it deserves a full day to explore. Be sure and pack a jacket, as the weather can be chilly even during the sunniest of days. 1. 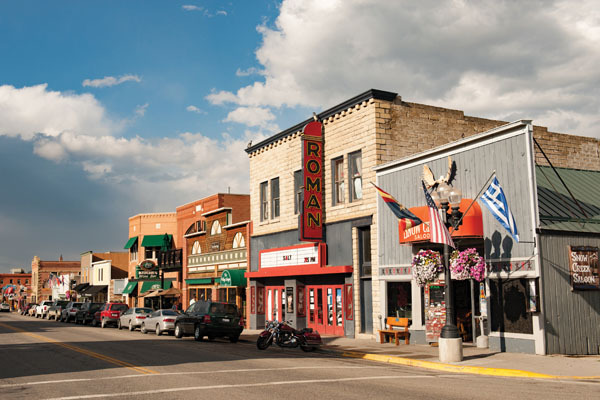 The gateway town of Red Lodge has a main street chock full of art galleries, eateries, antique and home décor stores, the very popular Montana Candy Emporium and Red Lodge Ales Brewing Company, a local favorite. You’ll find no shortage of adventure options here, along with the gear and guides to help you experience whatever is calling out to you, from mountain biking to whitewater rafting to fishing to hiking. 2. 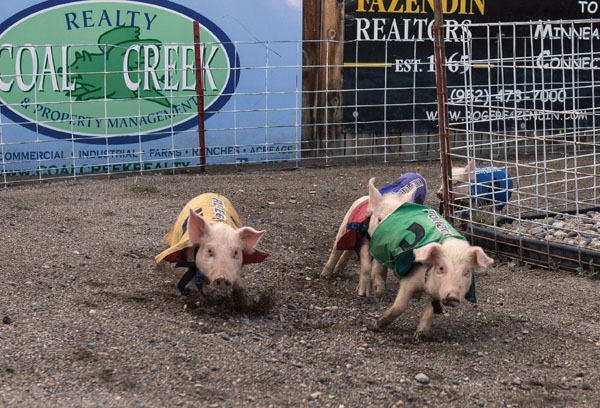 If your plans to drive the Beartooth fall on a Thursday to Sunday, spend the night in Red Lodge and check out the pig races at Bear Creek Saloon and Steakhouse, a 10-minute drive from Red Lodge. Bet on your favorite little squealer. Should your pig win, you get to keep half of the $50 jackpot; the remaining money goes towards scholarships for local kids, a fundraiser that’s been going strong for 25 years. 3. Once you leave Red Lodge, Hwy 212 snakes up a series of switchbacks with the first major pullout being Rock Creek Vista Point (complete with restrooms). 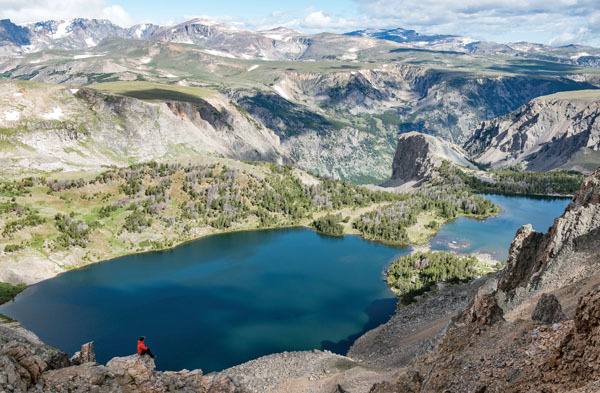 You’ll find sweeping views of both the valley floor and the spectacular Hell Roaring Plateau, part of the Absaroka-Beartooth Wilderness, directly across the valley at this 9,190 elevation stop. 4. 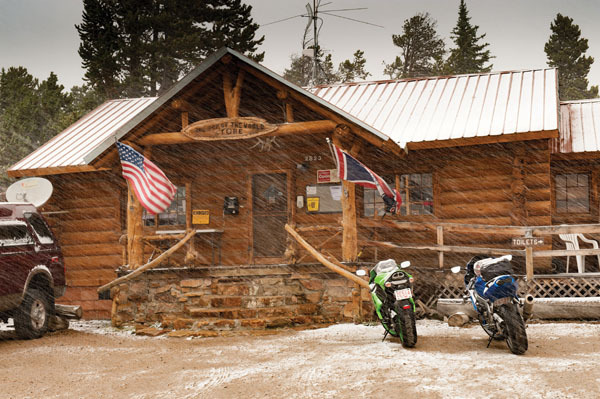 About 30 miles from Red Lodge you’ll see a sign marking the 45th parallel, the halfway point between the North Pole and the equator. Just past this marker as you’re heading southwest, you’ll catch glimpses of Twin Lakes, two cerulean beauties tucked into the bottom of a rocky valley. 5. The West Summit pullout affords views of the “bear’s tooth,” a jagged peak for which the highway was named. History tells us that the Crow Indians, also known as the Apsaalooke, inhabited much of this area which is now south central Montana. 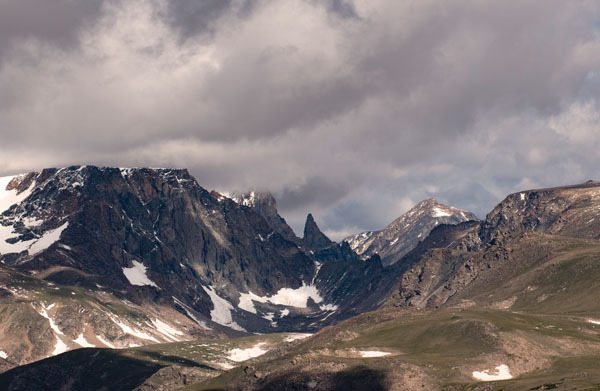 From Apsaalooke comes the derivative “Absaroka,” thus forming the origins for the name of Absaroka-Beartooth Wilderness. 6. It’s not uncommon during a summer storm to be met with a snow and sleet at these high elevations. The Top of the World Store — with a little bit of this and that, including souvenirs, snack foods, postcards, and coffee, can be a great place to hang until the storm passes over. As we say out West, if you don’t like the weather, wait a few minutes and it will change. 7. West Summit is the highest point along the highway and from here, the road gradually winds down through flower infused alpine tundra meadows sprinkled with mountain lakes. There is an unbelievable amount of landscape to soak in on all sides. Take advantage of the many pullouts to stretch the legs and grab some photos. 8. 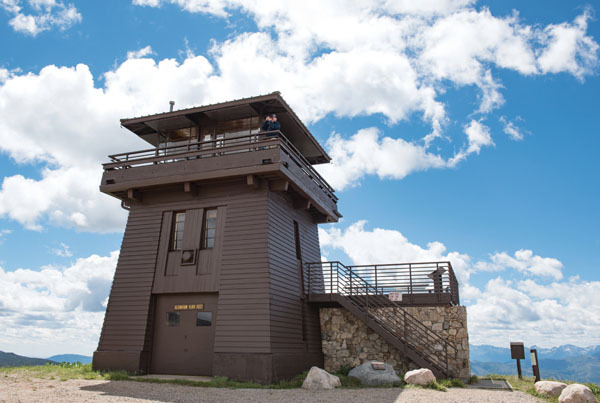 A popular detour along the highway is the three-mile gravel drive up to Clay Butte Fire Lookout Tower, now serving as a Visitor Center. The panoramic views from the tower at an elevation of 9,811’, are nothing short of grandiose — this is definitely a photogenic moment. Picnic tables and bathrooms are available at the Tower. 9. 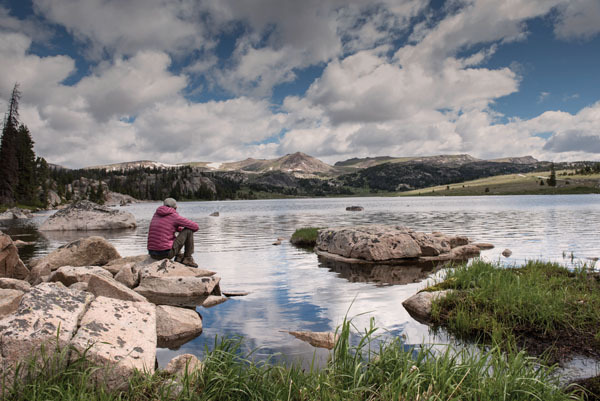 Long Lake parallels the Beartooth Highway and provides easy access for fishing, or better yet, taking time to contemplate life and drink in the crisp air. 10. Coming from Red Lodge as you get closer to Cooke City, you’ll see Pilot and Index Peaks appear on east side of the highway, as they rise majestically out of Wyoming’s Absaroka Range. It is said that these peaks served as historical markers for early day pioneers, miners, and explorers. 11. Cooke City, and its nearby neighbor Silver Gate, are little hamlets where time seems to have stood still. This mineral rich area, especially in gold, contributed to the start of these towns back in the late 1800s. Today, the summer population of Cooke City swells to a whopping 300. 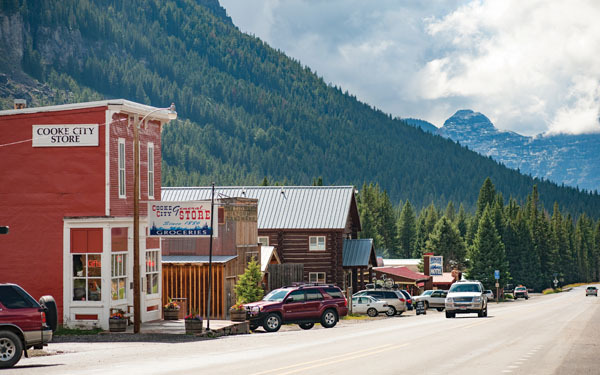 A must-stop is the General Mercantile, filled with everything you could possibly need or want from fishing supplies to souvenirs to food to clothing. 12. Just past Cooke City and Silver Gate, you’ll find the northeast entrance to Yellowstone National Park. 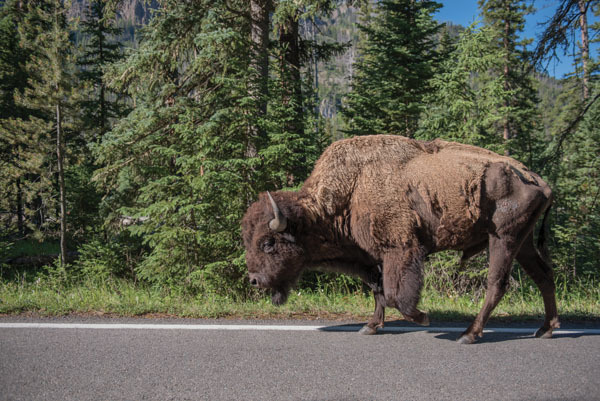 Be on the lookout for lumbering bison that shares the road with visitors, sometimes stubborn about moving out of the way. 13. The west end of the Beartooth Highway marks the beginning of yet another astounding landscape, that of our nation’s oldest park, Yellowstone. 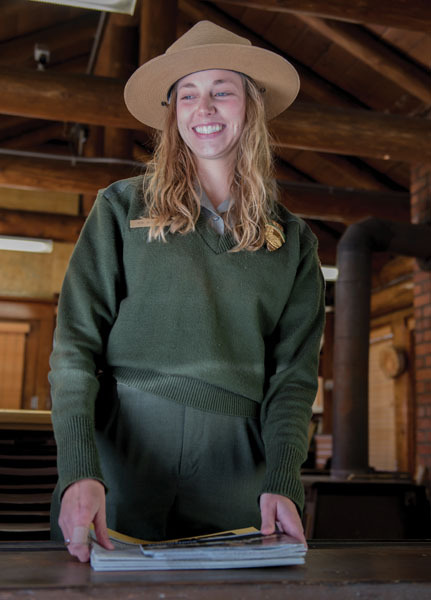 Park staff can address any questions and dispense a useful map to start the journey at the log entrance station. 14. 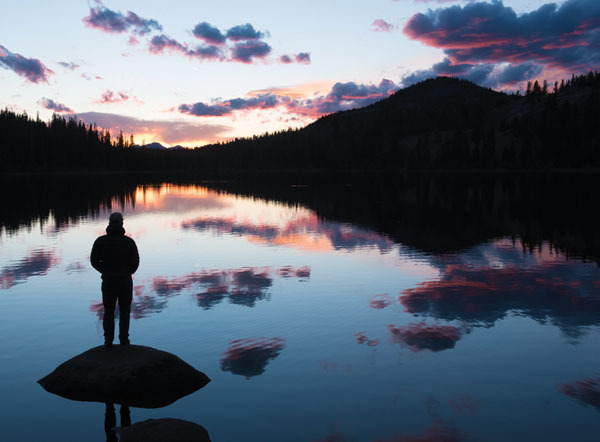 Just past the junction where the Beartooth Highway meets up with the Chief Joseph Scenic Highway 296, you’ll see a gravel turnoff on the north side of the highway that leads to Lily Lake, a beautiful spot for camping and soaking in amazing sunsets. 15. Don’t forget to look down as well as out across the powerful landscapes for the brilliant displays of wildflowers that peak during the months of July and August. For photographers, a macro lens will serve you well for getting in low and close to capture images. 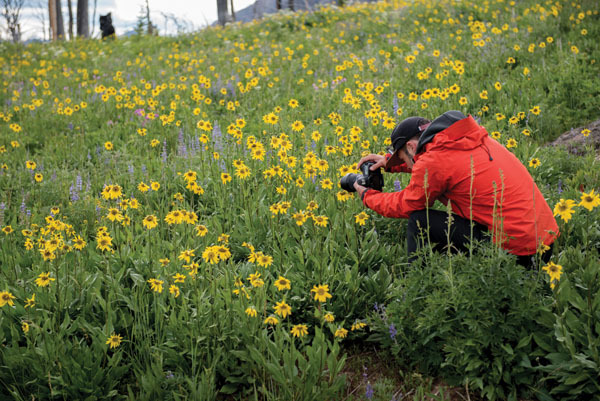 Pick up a guide to Montana wildflowers if you’re keen on identifying the various species.